Those of you that know me know that I’m a track and cross country running fan. Just this summer, while on vacation in Ireland, I diverted my family from the scenic Wild Atlantic Way to Cork just so I could watch the famous Cork City Sports track meet. A bit selfish of me but I did get to see the Irish women’s 200m record set. I used to run a lot back in the day. Parenting turned me into much more of a spectator than a participant. I wouldn’t trade it for anything in the world (being a parent). Now, with my daughter in college and more time on my hand, I’ve dusted off the old running shoes and started to huff and puff my way around the old neighborhood again. I have lofty goals – to run my first marathon next December. I have a long way to go to get ready. Most importantly, I need to exercise - patience. 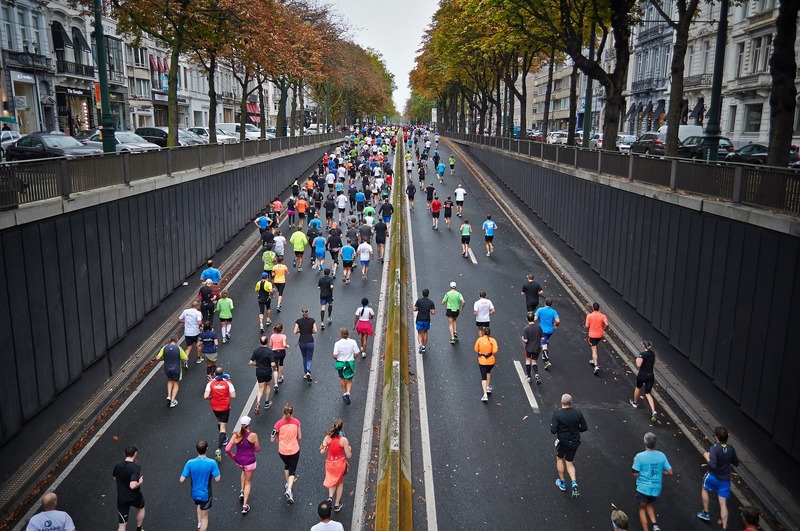 To help me get ready, I did what any other reasonable person would do – I watched the broadcast of the TCS New York City Marathon this past weekend after my four mile long run (hey, I already told you I have a long way to go to get ready). To pull off an event the size and scope of the TCS New York City Marathon takes a lot of logistics and coordination. As is typical with a huge race like this, the 50,000 plus racers were grouped into waves staggered about 20 minutes apart in order to avoid one huge stampede of runners, all starting at the same time. For race officials, keeping track of the finishing time and place of each runner could present a real challenge. Fortunately, RFID technology makes this endeavor much easier. By affixing RFID labels to the bib of each runner and strategically placing timing mats (RFID readers) throughout the course, it’s possible to track the progress and finishing time of each runner. In fact, this is how many races throughout the world are timed today – using RFID technology. Mostly gone are the days of clipboards and stopwatches. Most cross country meets today are timed using similar RFID technology – tags, timing mats (readers) and software to store and report on the information being recorded. In my home state of Colorado where high school races are 5 kilometers in distance (3.1 miles), the state cross country meet currently takes place on a hilly, challenging course in Colorado Springs. The first mile is slightly downhill. The second mile has a steep uphill section along with a lot of undulating terrain. And the third mile is mostly flat with a creek crossing followed by a final steep uphill section before entering a rodeo arena for the exciting finish (yee-haw!). At over 6000 feet of elevation, it can be a battle of attrition. Unlike pacing on a mostly flat course where one can run about the same speed throughout and easily assess progress along the way, pacing at the state meet presents a real challenge as to know whether one is running at their optimal pace for their level of fitness. What is optimal pacing for this meet? That varies with each runner but fortunately, RFID technology can help us get a little closer to determining what this might be. How? As the runners pass by the 1 and 2 mile points, their split times are automatically recorded by a combination of the RFID labels on the runner’s bib and the RFID reader timing mat. Having this data available makes it possible to analyze the pacing of any individual or group of runners. In looking for optimal pacing instead of the average pacing of the entire field, I looked at the top performing runners from each division. These were the runners that tended to pace themselves more optimally throughout the race given the uneven terrain. What the data ultimately showed is that the top performing runners (top five in each classification) averaged 31.17% of the total time in the first mile, 34% in the second mile, and about 31.5% of total time in the third mile. Go out too fast (very common) and you pay the price in the second half. Go out too slow (less common) and you finish the race with too much in the tank. Here’s how this would look for a runner finishing the 5 kilometer (3.1 mile) course in 20:08. Optimal pacing would be 6:17 for the first mile, 6:51 for the second mile and 6:21 for the third mile. In 2016 a runner capable of finishing in under 19:30 ran 5:55 for the first mile, 7:01 for the second mile and 6:34 for the third mile – finishing in 20:08. This runner went out too fast and paid the price in the second half of the race. This year, the very same runner ran much more optimal splits – finishing in under 18:30 and placing in the top 5. With RFID technology playing such an important role in race timing, are there similar applications for this technology in the workplace? Absolutely! For items that move such as incoming our outgoing shipments or work in process, using a portal similar to how a timing mat in a race is used can provide useful information to identify what has moved by and when. For items that move occasionally such as IT assets, tools or other equipment, using a handheld RFID reader is oftentimes the most efficient way to track items. For dangerous or hard to reach items, for example the top shelf of a warehouse, using a drone to find and track items can provide a measure of safety and speed to asset tracking. There’s never been a better time to use RFID technology to track the location and movement of assets (or racers). If you’re looking for a great race timing company, I’m happy to connect you with friends in the business. If your organization would like to explore how RFID or barcode technology can help you become more efficient, hit me up and I’ll see what we can do. Dan Schaefer helps organizations use RFID and barcode technology to streamline asset tracking. In his free time he can be found spectating cross country and track meets or training for his upcoming marathon. Enasys is an industry leader in Wireless Critical Asset Tracking solutions, helping companies become more compliant and ensuring they know where their assets are when then need them, for over 20 years.